If a dungeon is cleared, that player makes a new one, places it somewhere on the map, and adds new rumors to the main rumor list. Map grows organically as needed. This could be made more complex in various ways, resulting in a richer setting (each player also responsible for a town? a set of fleshed out random encounters? the encounter table for a given region? a custom class or race? ), but I think one PC and one dungeon per player is the fertile core. Rotating referee duties spreads the prep load around and works against overly comprehensive world building. 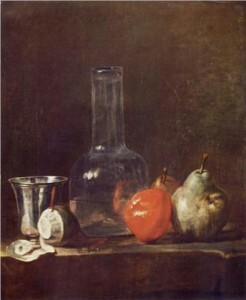 The juxtaposition of different styles creates a world with more diverse influences. This entry was posted in Uncategorized on May 31, 2014 by Necropraxis. The Carcosa supplement introduces a rule where hit dice are not rolled until combat begins. The hit die size is also determined randomly. At the start of an encounter, HD are rolled and left in front of each player. Damage is then inflicted upon the die with highest face value first. For example, a character with three rolled HD of 5, 4, and 2 takes damage to the 5 die first. If a die is reduced to zero, it is removed entirely from the character’s pool and only returned in the case of healing. If that character only takes (say) 3 damage during an encounter, all three HD are retained, and there is no persistent damage. I have used this system, and though it does take a bit getting used to, it works in practice more smoothly than it reads. This approach has a number of properties that may be disentangled if desired. 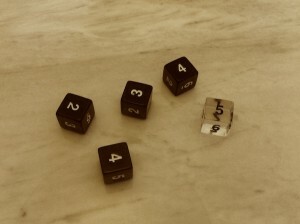 First, determining the die size randomly increases the uncertainty of combat. Though higher level characters are on average tougher than lower level characters, when combat starts you may be rolling four-sided dice for HP, twelve-sided dice, or something else. Second, rolling a handful of dice and letting them sit in front of you eases the tracking of damage, as there is no HP tally. You just have a max HD value written on your character sheet, and a remaining pool of dice in front of you. I think the second property would work well without the first (that is, rolling the HD at the beginning of combat, but not determining the HD size randomly). It would be especially convenient using OD&D style all six-sided HD, given the ubiquity of six-siders. How to handle bonus HP would need to be determined (the second term in an HD expression such as 1+1 or the bonus from constitution). The most satisfactory method would probably be to have a series of static “bonus” hit dice to represent those extra HP which would not be rolled. For example, assuming values from Men & Magic, a fifth level fighter with an exceptional constitution has 5+1 HD and +5 HP. This could be represented as 5d6 rolled plus one die set down with a “6” value. Handling penalties seems more tedious, and I cannot think of a better system right now than needing to adjust each die downward after rolling them. The B/X bonus scale of -3 to +3 also would require more bonus dice, with a mid-level high-constitution character having several “static” HD worth of bonuses, but it seems like that would not be overly cumbersome. Using HD as resources could require re-rolling them, removing them from the pool entirely, only removing them in the case of rolls less than (or greater than) the current rolled face value, or any other number of ways to modulate potential die removal. Rereading that post, however, I think it is probably less immediately approachable than the kind of modified Carcosa die system outlined here. This entry was posted in Rules and tagged combat on May 26, 2014 by Necropraxis. Naively, the current RPG community breaks down into three basic camps. New school, old school, and indie or story game. While this is an oversimplification, a perusal of a number of games on offer lends some substance to the categories. Fourth Edition D&D and Pathfinder: new school. B/X D&D and Lamentations of the Flame Princess: old school. Apocalypse World and Torchbearer: indie. This division exists based on a number of factors, including marketing reach, the fuzzy borders created by online forum participation, player expectations about game objectives, and differences between the actual texts of written rules. Many rules properties have been highlighted as potential differences. For just a few examples: lethality, quantity of character options, thematic coherence, rules coverage comprehensiveness, friendliness to ad hoc rulings, loci of narrative control, amount of prep required, rules heaviness, the number of resolution mechanics used. None of these factors is necessarily primary, as the old/new/indie categories are vague, though many of them are important. A dimension which I have rarely seen discussed, however, and which seems core to the difference in the approach many of these games take is the idea of proceduralism, by which I mean the degree to which a game directs your actions as a player or referee. Many old school games do not provide direct procedures. Instead, they give examples of the kind of things participants might do, often with a short script-like example of play. This is both a weakness and a strength. It is a weakness because it is notoriously hard to learn how to play an RPG (which involves conversational form, conflict resolution, rules math, and many other components) from a text alone. It is a strength because it leaves the borders of potential wide open, assuming that you want to use the rules more like a toolkit than a how-to manual. Of the old school games that I have read, OD&D and the Basic/Expert series have the most direct procedures. 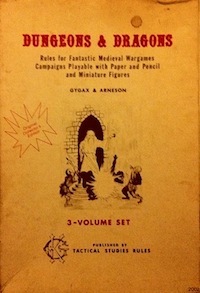 The first most likely because Gygax was essentially just telling you to do what he had done (“Before it is possible to conduct a campaign of adventures in the mazey dungeons, it is necessary for the referee to sit down with pencil in hand and draw these labyrinths on graph paper”) and the second because Moldvay was trying to create a self-consciously pedagogical text (more than a game with focused design, I would argue). Both of these works are only peripherally (or unintentionally) procedural; certainly nobody reasonable would claim that a referee that did not “sit down with pencil in hand and draw these labyrinths on graph paper” was breaking the rules of OD&D. Skipping forward a bit over the “story focused” 90s, we arrive at the Forge, the post-Forge indie scene, and the games that arose from those seedbeds. For some concrete examples, consider Apocalypse World, Dogs in the Vineyard, Torchbearer. Apocalypse World puts forth the rules as conversation mediators; they are things that kick in “when someone says particular things” and that “impose constraints.” Dogs in the Vineyard, Chapter VI: The Structure of the Game begins: “If Dogs in the Vineyard were a board game, this would be the board” and then presents an outline in the form of alternating directions to player and GM. And later in the book: “Every moment of play, roll dice or say yes.” That is a pretty strong directive. Torchbearer moves play through a series of different phases in a predefined manner, sometimes requiring character tests for transitions. Town phase leads to adventure phase, which may lead to camp before adventure again, or back to town. To someone used to D&D, this may just sound like shorthand for referee narrative, but it is structurally different. After three adventures, there is a winter phase. Wait, what? But what if we adventured three weekends in a row? No, that is not how Torchbearer works; you can’t do that. It breaks the rules, which abstract time in a certain way. D&D flirts occasionally with turn structure at different time scales, moving from the dungeon, to the wilderness, to the domain (“wargame”) turn as needed, but in a less defined, sometimes confusing, and certainly often overlooked manner. A game may be procedural in one domain but not others. For example, combat in all editions of D&D is more procedural than many other fictional activities. The game grabs hold of you and does not let you go until you have performed the necessary steps. Though there are little islands of such proceduralism, no edition of D&D really tells players what to do when moving between these islands. This is not necessarily a flaw, but rather a different rules property that creates its own set of consequences. It seems to be an implicit article of faith among many game designers that proceduralism has pedagogical advantages, and that games written with strict procedures are easier to pick up. This is possible, but far from established, and any such claim must also take into consideration extratextual resources such as the oral knowledge of communities, both distributed on the Internet and as passed between groups of friends in person. The game is more than the text. At a first glance, this may seem like a critical evaluation of the procedural tendency in many of these more recent games, but that is not the intent. In fact, the rules project that I am working on right now (which grew mostly out of my “JRPG Basic” Gravity Sinister experiments) is highly procedural. The many procedural additions I have made to my ongoing OD&D game have mostly resulted in gameplay improvements. You can see further gestures toward this direction in A method of play and Gravity Sinister gameplay. However, all that said, it seems to me that there are some real trade-offs involved in going in either direction along the proceduralism axis. This is not at all a case of more procedural games being more advanced or more evolved than less procedural games. This entry was posted in Speculations on May 22, 2014 by Necropraxis. Last Breath must be collected at the moment of a creature’s death and is usually stored in glass vials. I like the flavor of this mechanic, and the way it interacts with the encumbrance system (by using flasks for storage). It would be interesting to use something like this as a more general resource. Here is a simple idea along those lines. After death, souls linger for a short time before moving to the next phase. Conveniently for game purposes, this period is about ten minutes (which is to say, one exploration turn). A magician may spend this time collecting a soul if an empty flask is at hand. Do not neglect to roll for random encounters. Soul capture requires reciting minor incantations and performing the proper ritual gestures. At the end of this time, a soul is captured. Flasks, empty or occupied, are significant for purposes of encumbrance. No more than one soul may be stored per flask. Casting a prepared spell without expending it (called “drinking a soul”). Animation of an object (chair, broom, sword, corpse, etc) for one exploration turn. Feeding undead (like how rations or livestock work for living monsters). Using the soul in any of these ways negates its existence and destroys it utterly. Some claim that this is an abhorrent act, but certain groups of magicians have developed entire philosophies around the liberation of the souls bound to the reality through eternal recurrence. Sages have remarked that such philosophies are convenient for the earthly needs of magicians, but do not entirely discount the validity of such beliefs. Bottled souls may also be traded between magicians or otherworldly beings. Postscript: believe it or not, I totally wrote and scheduled this post before I started playing Dark Souls recently! This entry was posted in Rules and tagged magic-user on May 19, 2014 by Necropraxis. Below you can find a PC dragon class designed for use with various traditional tabletop fantasy RPGs. It assumes a relatively restrained power curve (think 3 LBBs) and thus might need to be punched up slightly if used with games that have a higher power expectation (just increasing HD and natural attack damage would probably be enough). I imagine it should work just fine for FLAILSNAILS play as is. A two-page PDF version is also available. 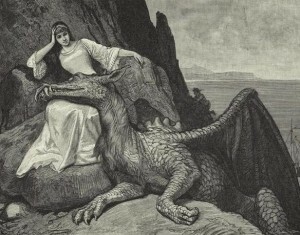 Other Character Types: There is no reason that players cannot be allowed to play as virtually anything, provided they begin relatively weak and work up to the top, i.e., a player wishing to be a Dragon would have to begin as let us say, a “young” one and progress upwards in the usual manner, steps being predetermined by the campaign referee. Adventuring dragons are usually disowned runts or survivors of insufficiently thorough paladin attacks. Solitary young dragons are usually killed if encountered by civilized folk and so may seek the protection of a treasure-hunting adventuring company. Dragon PCs speak common and the language of dragons. The appearance of dragons varies greatly. Scales are most commonly dark green with orange or white underbellies, but dull black and shades of deep blood red exist as well. Dragons age at varying rates based on successfulness accumulating treasure. Dragon size ranges from that of a large hound (whelp) to that of an elephant when full grown (tenth level). The bulk of even a full-grown dragon is sinuous, and can fit through standard doors if wings are furled. Openings smaller than doors may present difficulties, however. Dragon claws are not suited to fighting with weapons or manipulating anything much more complicated than a door handle, so dragons cannot use weapons effectively. Dragons prefer to walk on all four legs, but can hold an item in each fore claw when not moving. Armor is awkward for dragons, and hinders as much as it helps. As such, dragons gain no AC benefit from wearing armor, though dragon scales naturally gain in toughness as dragon level increases. Dragons can carry a number of significant items equal to strength, given harnesses and saddlebags, but much prefer not to, opting instead to have servants perform such manual labor. Dragons can use wands and staves, but no other magic items. A dragon’s flaming breath does 1d6 damage per level (save for half), with area coverage also equal to level. Thus, a third level dragon’s fire can catch up to 3 human-sized targets within its area and deals 3d6 damage (with a save allowed for half damage). Dragons may breath fire no more than once per exploration turn. Further, the total number of times a dragon breathes fire per day may not exceed dragon level. Dragon fire can damage enemies that require magic or silver weapons to hit. Some dragons have deadly breath of types other than fire (acid, lightning, frost, etc). With referee permission, you can choose a type other than fire. In any case, dragons are immune to damage of a type that they can breathe. For example, an acid-breathing dragon is entirely immune to acid damage. Dragons gain 1 XP for each GP worth of treasure accumulated in a hoard. If the hoard is depleted, no XP is lost, but no new XP is gained either until the hoard is replenished. A dragon’s XP total never rises above the hoard value. Funds spent on hoard guards, traps, interior decorators, and other home improvements do not count towards hoard value. Hoards consist of glittery things that you can sleep on and show off to guests. A lair must be established to store this hoard. Assuming the dragon takes reasonable precautions, there is little risk of burglary, though the referee is within rights to occasionally use stolen hoard elements as adventure hooks, assuming that clues are left behind. Whelps, with the aid of furiously beating wings, can reliably jump 10 feet high or 15 feet forward. Whelps may also fall an extra 10 feet without taking damage. Wyrmlings can fly awkwardly at half human movement rate, with a wing action that is the flying equivalent of doggy paddle. Wyrms can fly with more aptitude as long as movement is constant, or can fly awkwardly if also carrying something up to the size and mass of a human. Full-grown dragons can fly with agility and hover indefinitely given enough space to beat their wings. At this stage, a dragon could serve as a mount for a human and still fly well, though few dragons will do so as it is considered demeaning. This entry was posted in Rules and tagged class on May 12, 2014 by Necropraxis. XP = treasure spent is one of my top-shelf house rules, up there with encumbrance by strength. This method of managing advancement has become pretty important to how I play D&D. However, it presents two challenges. One is that there must be supply to match player demand (that is, interesting things to spend money on). Living costs, retainers, and equipment constitute partial supply. Another is that it makes players more present-biased, as treasure must be disposed of in order to acquire XP, which works against saving for large expenses such as strongholds. This is not entirely a bad thing, as it incentivizes the iconic Swords & Sorcery behavior exemplified by Conan, Fafhrd, the Gray Mouser. However, this can work at cross-purposes to some degree with the mid to high level domain game. To address these issues, I suggest introducing a new common town feature: the bank (or merchant house, or whatever you prefer to call it). PCs may deposit money in a bank to take XP immediately. Bankers, being important folks, are not going to concern themselves with pocket change. If you want to make a deposit, it must be in round numbers with at least four digits (of whatever coinage is being mapped to experience points). Withdrawals are not in coinage, but instead in bank notes (which have similarly large denominations). Spending bank notes does not grant XP (that would be double dipping). Bank notes are primarily useful for funding expenses such as mercenary companies, fortresses, and ships. From a game perspective, all that need be tracked on the character sheet is the bank in question and the deposit amount. Of course, bankers pay interest, and this is represented by 1100 out in note value for each 1000 put in (nice round numbers, because I am lazy). This provides the standard economic trade-off between less now or more later. The amount on deposit could also double as some sort of reaction bonus for social interactions with the bank. Needless to say, someone will bring up the bank as lucrative target. And I say to that, go for it! Heists make good adventures. However, good luck getting more than a few thousand coins from knocking over a bank, as most bank assets are in the form of obligations owed by others, not hard currency, and any heist will of course have social ramifications (not least being the adventurers becoming wanted criminals if identified). I could even see adventurers being called in to defend a bank with which they have deposits. If you owe the bank $100 that’s your problem. If you owe the bank $100 million, that’s the bank’s problem. — John Paul Getty (mutatis mutandis, of course). This entry was posted in Rules on May 5, 2014 by Necropraxis.